I have been celebrating Chanukah all of my life, lighting candles since I was old enough to hold a small flame, my father’s hand to steady mine. But with each place and home I visit, I learn more about not just other people’s cultures, but of my own religion and traditions. This year I was in Israel, for the third time for this festive holiday. It wasn’t the first time I had the honor of celebrating the holiday in Tzfat (aka Safed) — but I still had new experiences and still learned more. 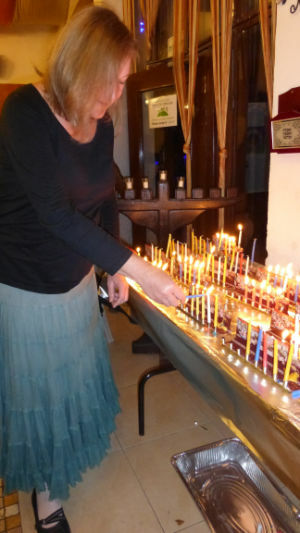 On the first night of Chanukah, I sat with a patient American woman who is now an Israeli citizen. She loaned me a Chanukia (aka Menorah but the Chanukia is specific) for the Chanukah candles I’d bought in Jerusalem earlier that day and she led me through the Chanukah brucha or bruchas, the words we say as we light our candles. This was a new first for me; I have always read the transliteration. Here, with much guidance, I read the prayer in actual Hebrew words and learned much from the English translation printed below them. 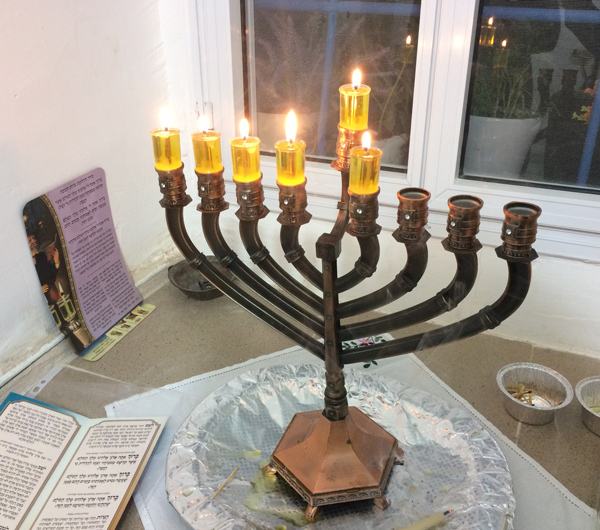 On the 2nd and 3rd nights of Chanukah, having the Chanukia loaned to me by my generous American friend but having left my candles behind in her home, I didn’t light. As I watched my hosts light, I enjoyed the melodious way host David sung the words of prayer. Another first. Until this, I had only heard them spoken. On the next 3 nights of Chanukah, I had another different treat as I shared the lighting of a large oil Chanukia with my friend Michal — as she spoke the words of prayer from her heart, and then sang the familiar Chanukah tune of the story of the Jewish people through all time. On the last 2 nights of Chanukah, as I had the honor of being selected to be friend-of-the-bride for a woman I’d met in Tzfat upon my first visit, I was at the Ruth Rimonim hotel of Safed to keep her company and help her out for the two days before her wedding. Sitting in the lobby there, I watched groups and families come light, help their children light and then enjoyed their singing. Potato latkes (pancakes) — one of my favorite foods! While buying my Chanukah candles before Chanukah evening on the 1st day, I treated myself to a fabulous custard-filled donut from the Brooklyn Bakery in Jerusalem. Three years ago I’d discovered that Brooklyn Bakery baked the perfect New York City Black & White cookie — something I have missed whenever not in NY. That same thick layer of their rich chocolate icing (the black in Black & White) fully covered the top of this generously-stuffed sweet dough creation. This was by far the best donut I have ever had in my life! Although technically I enjoyed this treat before Chanukah, I celebrated it as a perfect start. Its memory carried me through the two-bus trip back to Tzfat hours after. I wish I had a photo of it for you but my full focus was on enjoying it and I didn’t stop to take a selfie. On the 2nd night of Chanukah, my friend Rachel made latkes and I couldn’t resist doing the second batch of frying. On my previous Chanukah in Israel, I’d bought a grater just to make latkes at her house so it was fun to recognize the grater she was using. On the 5th night of Chanukah, after she finished singing, my friend Michal said: “And now we make Sfeenge. Do you know what they are?” I hadn’t known this word, but I correctly guessed it would be a type of donut. Within minutes I had my coat on and was running up the stairs to the main road to buy yeast. 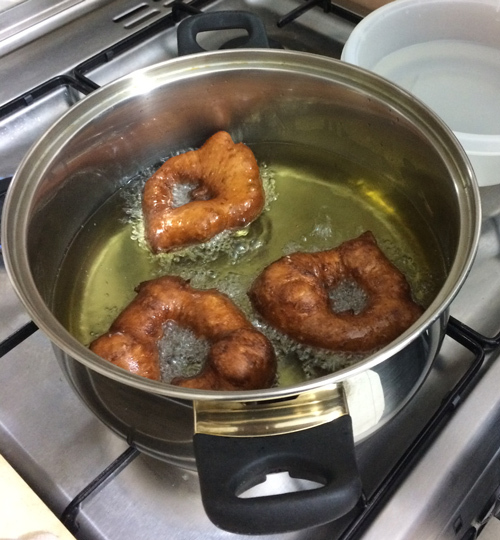 An hour or so later she and I were enjoying fresh, hot, homemade donuts. She likes hers with Date Honey (a sweet treat I hadn’t known about until I traveled to Israel). I enjoyed mine with a bit of Date Honey and a generous dip in the freshly-ground cinnamon I’d brought from Nissan at my favorite spice shop in the Jerusalem shuk just a few weeks earlier. On the 6th day or evening, Michal made another Chanukah treat that was new to me. It was a fried cheese dish. At the start of my travels, I was in NYC for Chanukah. I was house-sitting for some friends who were away for Christmas. Finding myself without a Menorah, which I now call a Chanukia, I fashioned my own. It worked well and I think it’s one of my favorites. In 2012 I was in Panama City. One night I attended the Chanukah party of a Progressive synagogue. My connection to this synagogue came by way of the synagogue I attended for months in San Salvador. We played dreidel for large Lego bricks. Then we all piled our bricks into the center of our respective tables. And then… each table built our own Chanukia and voted for the best one. It was fun! In 2014 I was in Israel. First I was in Jerusalem where I saw my first amazing outdoor Chanikias. Then, I was in Tzfat where I stayed at Ascent and all of us lit. Two large tables full of glowing candles lighting up the word was quite a sight! I lit at the 2nd table, the smaller of the two, as the first was quickly filled. In 2015 I was still in Israel, this time alone in a private apartment. I bought this inexpensive Chanukia at Max (the day I bought the grater) and lit by myself. It’s a tradition to sit and watch the candles for a while. That year I had two sets to watch as I loved watching the reflection as well. Appropriate as we sit and reflect?